“The 6th edition of the Germán Bernácer Prize has been awarded to Prof. Hélène Rey (London Business School) for her important research on the determinants and consequences of external trade and financial imbalances, the theory of financial crisis and the internationalization of currencies. Her contributions help to improve our understanding of the connections among globalization, exchanges rates and external markets”. 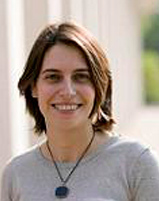 Hélène Rey (France) is the Lord Raj Bagri Professor of Economics at London Business School. Her research focuses on the determinants and consequences of external trade and financial imbalances, the theory of financial crises and the organization of the international monetary system. She demonstrated in particular that countries gross external asset positions help predict current account adjustments and the exchange rate. She studied a Master Degree in Engineering Economic Systems at Stanford University and in 1998 she got her PhD in Economics from the London School of Economics (LSE) and the Ecole des Hautes Etudes en Sciences Sociales (Paris). In 2013 she received the European Economic Association fellowship, the Econometric Society fellowship and the Yrjö Jahnsson Award (shared with Thomas Piketty). In 2014 she was named one of 25 brightest young economists by the International Monetary Fund. She has published widely cited papers in leading journals like American Economic Review, Journal of International Economics, Journal of Political Economy, Review of Financial Studies, etc. The award ceremony took place in Madrid on May 21st, 2007.